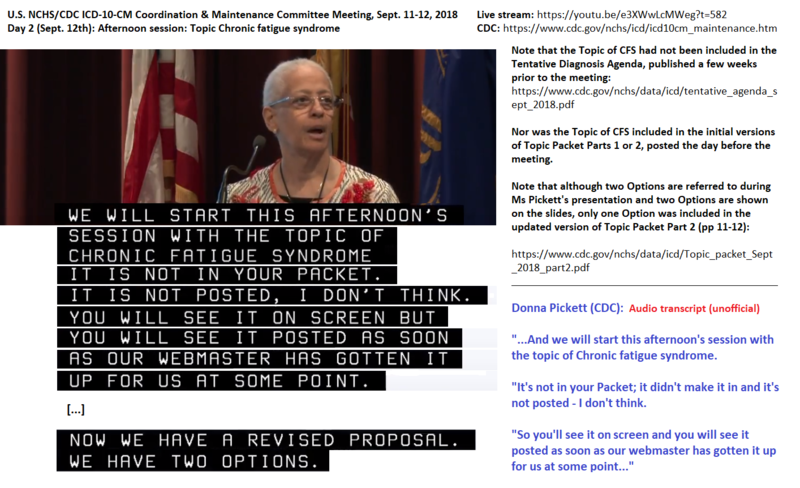 Discussion in 'General ME/CFS News' started by Dx Revision Watch, May 4, 2018. Australian Edition on December 30. If your country is a member of SNOMED International but does not have a public browser hosted on the International Edition platform or on its own platform, please refer to your country's SNOMED CT National Release Centre website for the twice yearly release schedule. JohnM, mango, Sly Saint and 1 other person like this. 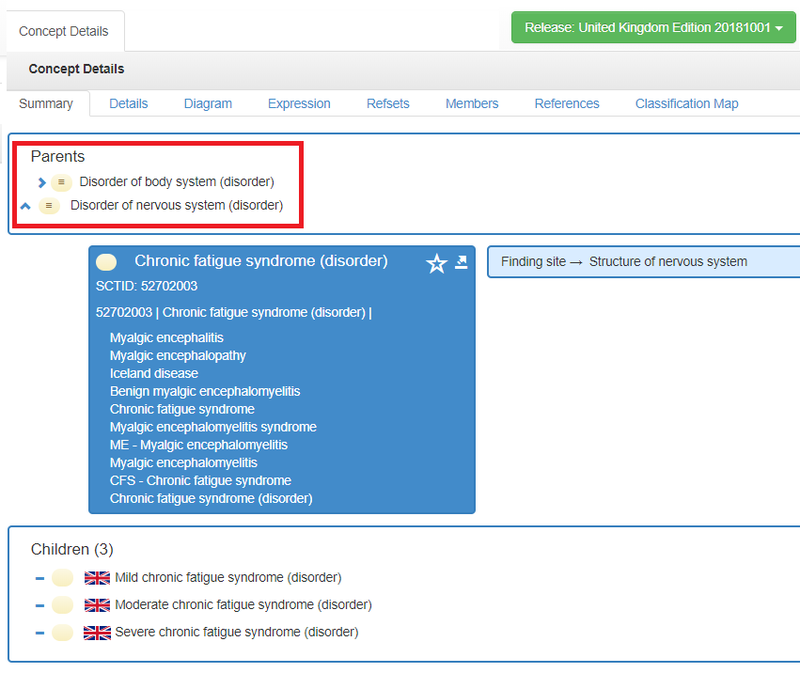 The October 01 release of the SNOMED CT UK Edition is now available from the NHS Digital public version of the SNOMED CT browser. 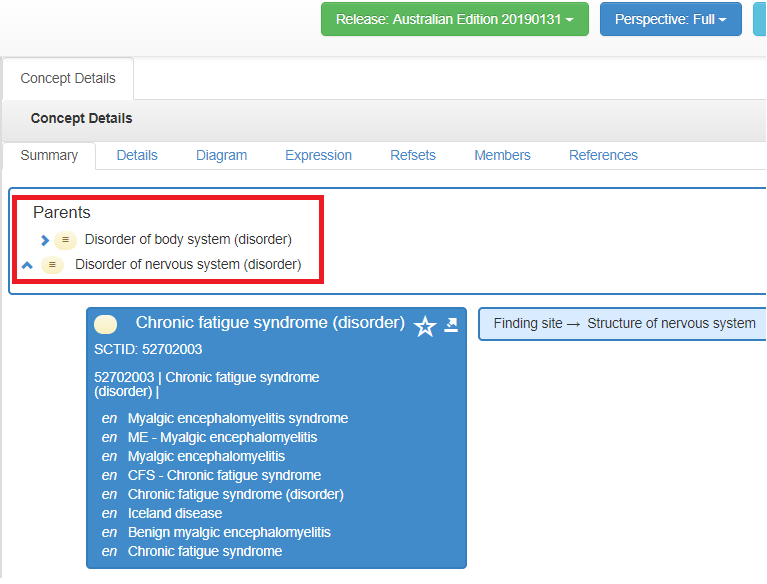 This UK release incorporates the addition of the parent "Disorder of nervous system" for CFS and terms under Synonyms, as approved and implemented for the July 2018 release of SNOMED CT International Edition. SCTID: 52702003 Chronic fatigue syndrome (disorder) is now classified under supertype SCTID: 118940003 Disorder of nervous system (disorder). 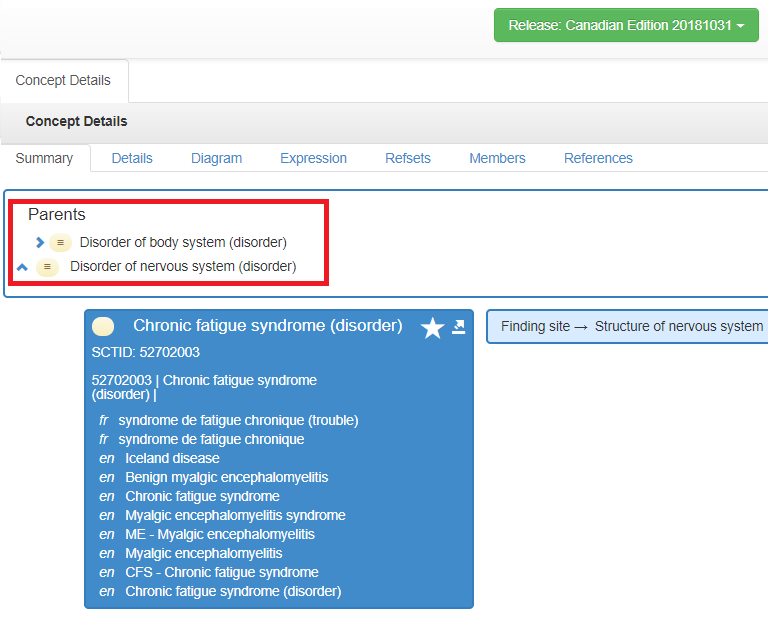 Concept: SCTID: 52702003: Chronic fatigue syndrome (disorder) was already mapped in the SNOMED CT to ICD-10 cross map to G93.3 Postviral fatigue syndrome. This change of parent Concept or supertype consolidates that existing relationship. The next release of the Uruguay Edition is scheduled for December 15. Esther12, JohnM, Alison Orr and 4 others like this. 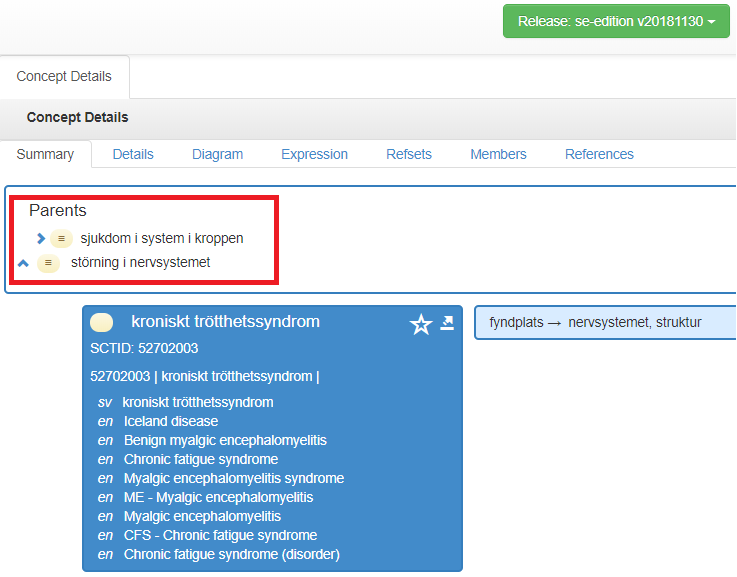 Re: a request that "neurasthenie" is removed from the list of Synonyms terms in the Netherlands Edition of SNOMED CT.
"Bedankt voor de inhoudelijke feedback. We hebben het uitgezocht. Het blijkt dat wij de verwijdering niet van onze Nederlandse bron door hadden gekregen. We hebben het nu gecorrigeerd. In de volgende release (maart 2019) zal het te zien zijn." "Thank you for the substantive feedback. We've sorted it out. It turns out that we had not received the removal from our Dutch source. We have now corrected it. It will be shown in the next release (March 2019)." With thanks to @mecvsnieuws for taking this up with Pim Volkert and for achieving a prompt and successful outcome. Esther12, Inara, Maggie and 6 others like this. Esther12, mango, Arnie Pye and 1 other person like this. Tomorrow I retire from advocacy, after 16 years mired in the cesspit that is ME politics. As previously mentioned, I am providing a list of 10 key "legacy" reports and documents from my website on the current status of ICD-11 and SNOMED CT. There is an additional post to add which I did not have time to compile this week. I will edit this in when it's been published on my site, next week. Once I have stepped back, it's not my intention to continue to contribute to forums, Twitter or other platforms on any issues. But I shall be keeping an eye on the orange ICD-11 Maintenance platform in case there are any developments with my unprocessed proposals, with the Dr Tarun Dua proposal of November 6, 2017, or with any potential new proposals from the ICD-11 MSAC or CSAC committees that may require my attention. Simbindi, Webdog, Stuart and 18 others like this. Much thanks to you for all your work over the years @Dx Revision Watch. All this ICD bureaucracy stuff makes my head spin - I have no idea how you keep up with it all. You'll be sadly missed for your many contributions. Simbindi, Webdog, Stuart and 13 others like this. JohnM, Arnie Pye, Sarah and 6 others like this. Best wishes for your future and a very good time, Suzy! Stuart, JohnM, Arnie Pye and 8 others like this. I echo everything @Esther12 has said. Thank you doesn't cover it, but nonetheless a sincere thank you for all your years of advocacy work, @Dx Revision Watch. I really wish you and your family all the very best. Stuart, ScottTriGuy, JohnM and 7 others like this. You have done tremendous work. Thank you for your time and dedication. I wish you the best. Thank you so, so much for your important advocacy work! You will be missed. I wish you and your family the best. Stuart, ScottTriGuy, JohnM and 6 others like this. Thank you for your resolute determination and work. You will be sorely missed. It takes a particular type of thought process to stay on top of the myriad of changes and their impact, sadly mine is too tangential for duch a process. I hope you have lots of things to look forward to do ( i can' t imagine the amount of time that must have been involved ). Enjoy ! Stuart, Maggie, ScottTriGuy and 7 others like this. Thank you for all your hard work, @DxRevisionWatch. It is very much appreciated. I wish you and yours all the best for the future. Maggie, ScottTriGuy, JohnM and 3 others like this. I shall not be available to comment further on this new paper as I am now retired, but a copy needs to be in this thread. Note that the ICD-11 PHC has not yet been released by WHO and WHO has published no date for its projected finalization and release. In April this year, WHO was asked to confirm the current development timeline for the ICD-11 PHC via a formal request to their information office, but failed to provide me with this information. Dr Geoffrey Reed had also been asked to provide clarity around the finalization and release targets for the ICD-11 PHC and whether any public review and comment exercise has been considered. My understanding is that Forward-ME did not receive a response, either. I am no longer in a position to confirm whether Forward-ME had followed up on this. It remains unclear whether the ICD-11 PHC cannot be finalized and released until after the core ICD-11 MMS has been approved by the World Health Assembly. (ICD-11 core version is currently scheduled for presentation for approval in May 2019, with WHA's approval, if obtained, coming into effect on January 01, 2022.) It also remains unclear whether any additional field trials or evaluation of existing field trials for proposed new categories for the ICD-11 PHC are being planned or are in progress. Note also, that although the paper refers to the DSM-5's Somatic symptom disorder (SSD), it makes no mention of, or comparison with, Bodily distress disorder (BDD), the divergent SSD-like construct that has already been included in the core ICD-11, as released on June 18, 2018. Studying ICD-11 Primary Health Care bodily stress syndrome in Brazil: do many functional disorders represent just one syndrome?. Fortes, Sandra, Ziebold, Carolina, Reed, Geoffrey M., Robles-Garcia, Rebeca, Campos, Monica R., Reisdorfer, Emilene, Prado, Ricardo, Goldberg, David, Gask, Linda, & Mari, Jair J.. (2018). Stuart, MEMarge, rvallee and 12 others like this. Dr Tarun Dua is Medical Officer, Program for Neurological Diseases and Neuroscience, Management of Mental and Brain Disorders, WHO Department of Mental Health and Substance Abuse. 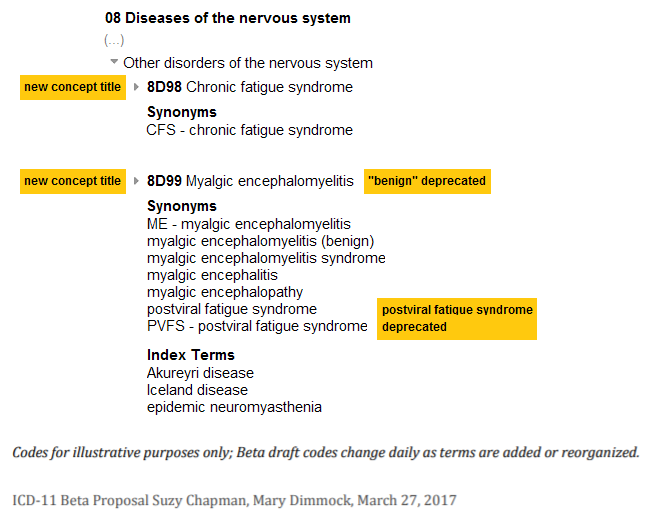 Dr Dua's proposal, which she has stated was submitted on behalf of the now sunsetted Topic Advisory Group for Neurology, had recommended moving “Myalgic encephalitis/Chronic Fatigue Syndrome (ME/CFS)” [sic] from the Diseases of the nervous system chapter to the Symptoms, signs chapter, as a child under Symptoms, signs or clinical findings of the musculoskeletal system. In response to the many proposals on Chronic fatigue syndrome, the WHO Secretariat has conducted a vast amount of research. Findings: The condition is characterized by chronic, profound, disabling, and unexplained fatigue and coinciding symptoms such as sleep problems or post-exertional malaise. There is no agreement on a reliable diagnostic symptom pattern. The etiology is still being discussed and there is no uniform treatment approach with reliable outcomes. The only constant is the lead symptom ‘fatigue’ that persists over time. Decision: As a result of this study, the category ‘postviral fatigue’ that is the indexing target, will not be changed as currently there is no evidence to suggest a better place. The entity will retain its name and remain within the Nervous system chapter. The Medical and Scientific Advisory Committee and the Classification and Statistics Advisory committee supported this decision. As you know, I retired from advocacy work in early October, but I continue to monitor the ICD-11 platforms for my own interest. brf, Hutan, Stuart and 20 others like this. This is good news, thank you Suzy. Hutan, MSEsperanza, Maggie and 7 others like this. Thanks Suzy. I expect that it was very largely your work which let us dodge a bullet here - I'm very grateful. Particularly as now you've retired I don't think we would have been able to organise a response to Dua's proposal being accepted that would have been half as good as one you'd led. Your pre-emptive work is really a lesson to us on effective advocacy. I feel like I tend to ignore complicated processes like these as they're slowly trundling along, and then get outraged after things have gone against us. It's so much more sensible to be engaging in the difficult and (imo) boring work of carefully and steadily challenging any problems as soon as they appear. Simbindi, Hutan, Stuart and 15 others like this. Your pre-emptive work is really a lesson to us on effective advocacy. Over Christmas 2011, she received two "cease and desist" letters from American Psychiatric Publishing, an arm of APA. The letters were standard legal boilerplate". Simbindi, Stuart, MSEsperanza and 10 others like this. Thank you Suzy for keeping this updated. MSEsperanza, Maggie, inox and 4 others like this. Proposal to remove "Benign" from "Benign myalgic encephalomyelitis." Proposals for exclusions for ME and CFS under BDD, and exclusion for BDD under ME and CFS. Lily Chu's proposals on behalf of the IACFS/ME (similar to above but proposes three discrete codes for PVFS; CFS; and ME). brf, Stuart, Esther12 and 8 others like this.